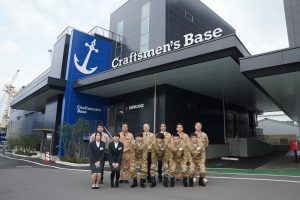 A ceremony for employees joining Sanwa Dock in April 2019 was held on April 1st in a conference room on the 4th floor of Sanwa Dock’s head office on Innoshima Island in Onomichi City. Following a speech by President and CEO Isamu Teranishi, the executives were introduced, and the new employees introduced themselves. There is a total of 6 new employees for 2019: 2 engineers (university graduates), 2 technicians (high school graduates), and 2 office workers. Here at Sanwa Dock we are committed to continuing our efforts to maintain and improve our high-quality repair service by hiring and cultivating a diversity of talent. The new employees will participate in a training program for new hires at the Innoshima Technical Center on Innoshima Island. The engineers will receive 1 months and the technicians 3 months of technical training from veteran engineers. Then upon receiving the requisite qualifications, they will begin working at their assigned posts. “Safe Navigation at Sea” is our motto.